Saturday morning sessions at AMATA with Grace Murdoch. Come and explore contemporary dance and improvisation in a creative, exciting environment with opportunities to share/perform and learn about improvisation and movement skills. 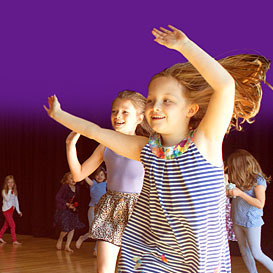 Click Here to book for the summer 2019 term. Falmouth Graduate Lauren Syrett (The Dance Initative) is offering Creative Dance for Bump to 4 years. Click Here to book for the full summer 2019 term. Drop in weekly rate £4.50 from 15 September 2018. Summer term 2019 (11 sessions): 40.00 (block booking) - No payment needed for the session on 25th May.